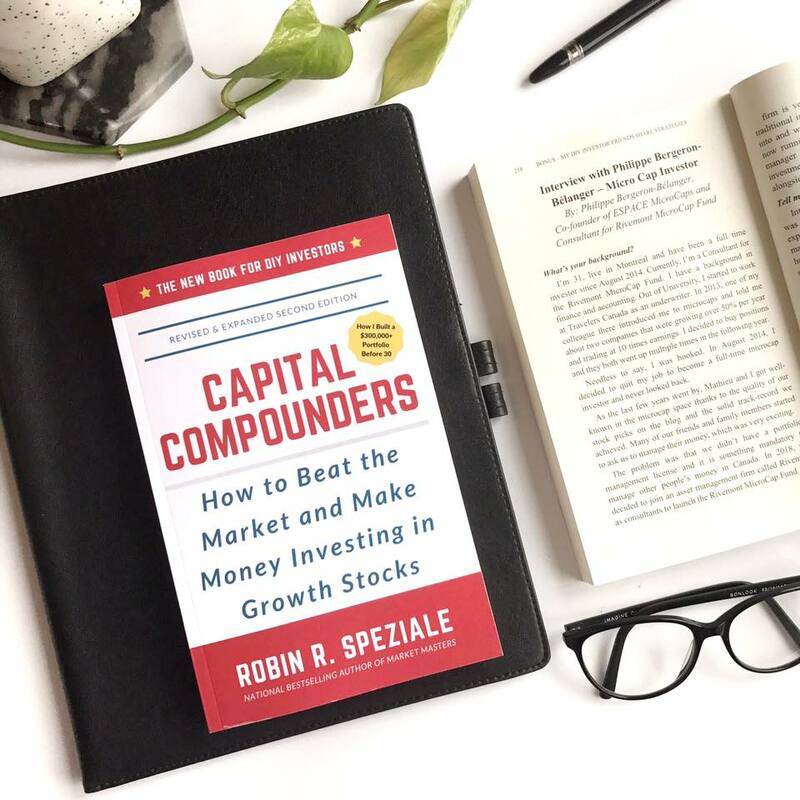 Last weekend, my empty schedule was the perfect opportunity to finish reading Robin R. Speziale’s brand new book Capital Compounders, which was released worldwide on November 4th. For those who didn’t see our Facebook post, Philippe and I are very proud to have been featured in a section of the book! More on that later. The 277-page book reads very well, so well in fact that I read the whole thing in just four days. 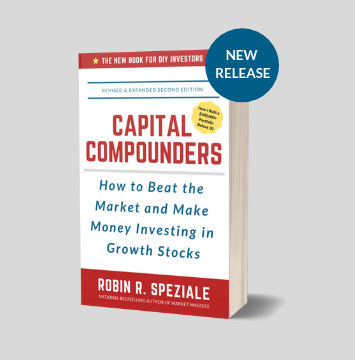 Unlike many investment books, Speziale’s writing style is captivating, offering a judicious mix of practical advice, stories and real life examples. For those who don’t know him, Robin R. Speziale is a successful investor and author of the Globe and Mail national bestseller Market Masters (2016). He has been investing in the stock market since 2005 and, while learning to invest by himself, built an investment portfolio of more than $300,000 before his 30th birthday. In addition to writing books, he runs a blog and newsletter to help Do-It-Yourself (DIY) investors like you and I in their journey. The fact that he learned by himself without any specific education in finance makes his advice very practical, which is highly interesting to read in my opinion. Speziale describes himself as a growth investor, which means he puts less emphasis on the current valuation of a stock if the company is high quality and shows signs of strong growth potential for many years to come. This philosophy runs contrary to value investing, which consists of buying stocks that represent bargains according to different measures (very low price/earnings ratio, cheap valuation compared to industry peers, etc.). Value investors favor current value over future growth, although companies meeting these criteria are sometimes found in declining industries or experience temporary difficulties. The debate between the merits of growth and value investing is ever-present throughout the book and it’s clear from the outset that Speziale does not believe in value investing. Personally, I consider my investment style to be a hybrid between both styles, but with a slight tilt towards value. Capital Compounders highlighted some concepts that I thought were very interesting about growth investing, namely how to identify and properly value growth stocks. I think it’s important, in order to evolve as an investor, to try to see things from different angles and then incorporate the most interesting elements into your own style afterwards. To start the book, Speziale shares his “72 rules for investing in stocks”, a compilation of all the lessons he’s learned over his thirteen years of experience. I was glad to see that many of his investment criteria are similar to mine, particularly with respect to the sectors he avoids (mining, oil & gas), the fundamental qualities he looks for as well as his research and due diligence process. Speziale’s portfolio is primarily composed of Canadian small and mid cap companies, with a small portion in microcaps. Although small and mid cap companies are a bit more mature than microcaps, there are still many similar aspects in the process to find good investment opportunities. As an investor who is 100% dedicated to the microcap sector, I thought this perspective on small and mid caps was very interesting and it’s one of the facets of the book I appreciated the most. In the second half of the book, Speziale openly shares the stocks that currently make up his watch list. Surprisingly, there were a number of high quality microcap companies that I follow as well on that list. I took the opportunity to note those I didn’t know in order to take a look at them later. If I can just find one new profitable investment idea after my research, it could well be worth hundreds of times the price of the book! Towards the end, Speziale makes several predictions about the future of various industries and how they could be disrupted in the years to come. Some examples of predictions: robots will replace jobs and make our lives easier and more productive, the world will be more electric and less reliant on fossil fuels, usage of plastic packaging will for the most part go away and be replaced by greener alternatives, space travel will become as affordable as a round-the-world plane ticket, and so on. Whether one agrees with these predictions or not, the chapter certainly stimulates reflection about the positive and negative impacts certain long-term trends might have on entire industries. Finally, the last section of the book, titled “BONUS – My DIY Investor Friends Share Their Growth Investing Stories, Tips & Strategies” is just what the title implies, a compilation of advice from other investors in Speziale’s investing circle. It’s in this section that we have been featured; Philippe with an interview about his background and investment philosophy, and then myself with the publication of one of my recent Espace MicroCaps blog posts. A great honor! Some would say I’m biased to recommend reading Capital Compounders, but this is undoubtedly one of the best books I’ve read this year (among the 23 books I’ve finished so far in 2018). 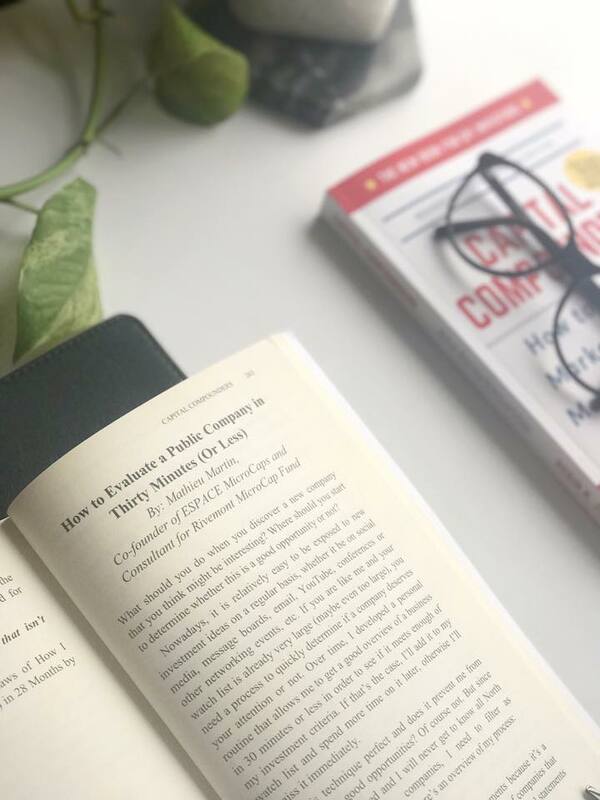 If you are like me – curious to learn about investing from a slightly different angle – this book is definitely for you! The concepts are well explained and easy to apply in your everyday investing process.